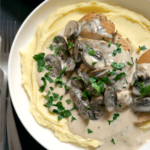 Slow Cooker Mushroom Chicken in Creamy Mushroom Sauce, a delicious dish that takes comfort food to a whole new level. Super easy to make, big on flavours, and a favourite with little and big tummies. A great family dinner recipe. Place the chicken breasts in the slow cooker, and add the chicken stock, chopped garlic, thyme and sliced mushrooms. Cook on low for 5-6 hours, or 3 hours on high. Once the chicken is cooked, remove the chicken breasts, add the parmesan, double cream and cornflour (which is mixed with 2 tablespoons of water), and cook for 5-10 minutes longer on high, until it thickens into a sauce. Add the chicken back to the slow cooker, and garnish with fresh parsley.